“The Ocean weeds out, from all those races of mankind that come upon it to make a living, a certain type of person. This type of person stays with the Ocean, and the rest are cast back ashore to deal with the land people.”– Dr. W. ChapmanGreetings Readers,It’s time to give you some news and views on all the exciting new developments going on at Ace Diving. Being the definitive commercial diving services solution is hard work and constantly keeps us on our toes. One of the most interesting pieces of news of late is the details of our continuing and quickening expansion. 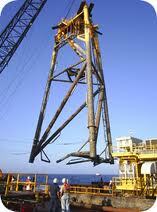 Ace Diving Services has been appointed as the preferred diving contractor to OPI International. This prestigious contract is to provide diving services on their newly acquired Derrick Lay Barge, which will initially be based in West Africa. Ace Diving and OPI are not strangers, both of Ace’s Directors having previously worked with OPI. Art Siviter, was an air/sat diver and supervisor with OPI & OPD and later West African Operations Manager for OPI Diving Division. Craig Seaton was a diver for OPI in both West Africa and the Middle East. The positive synergy created back then is back for 2010, and Ace are very proud to lay claim to this contract. Much of the former OPI management is back and it is going to be exciting working alongside these guys, all of whom are all well known and very experienced. To service OPI’s needs and keep up our faultless standards, Ace Diving have acquired two additional air / gas diving spreads that are currently being mobilised to West Africa. The first contract has already been awarded and consists of four pipelines, one umbilical and a platform-installation in 140’ FSW. Mobilisation will commence late October 2010. Our commitment to safety standards, business principles, service excellence and faultless administration has always stood us in excellent stead, and now we are ready to go to the next level. To help achieve this goal, Craig & Art recently attended an OGP (International Association of Oil & Gas Producers) course at the National Hyperbaric Centre in Aberdeen. The aim was to assist us in gaining a better understanding of the role of the Client Rep as it pertains to diving operations and the role of the OGP Diving Operations Sub Committee vis-à-vis Diving Recommended Safe Practices. Contact us if you would like to find out more about Ace Diving.